A fresh musical that hooks you instantly with its honesty and beauty. Few shows are as moving, relatable and funny. This show is breaking new ground and it succeeds because it strikes at something so honest. Its material has been mined for universal truths about love, acceptance and compassion. 'Fun Home' demonstrates how much our world has changed and reflects just how far we’ve come. A rare beauty that pumps oxygenating fresh air into Broadway. This impeccably shaded portrait of a girl and her father tries to solve the classic mystery: Who are these strange people who made me? I can’t think of a recent musical — or play, for that matter — that has done a better job at finding theatrical expression for the wayward dynamics of remembering. 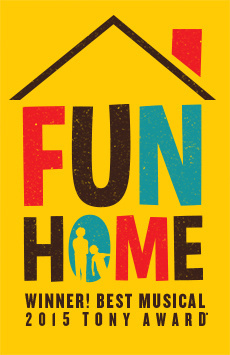 Heart-gripping and cathartic, 'Fun Home' occupies the place where we all grew up, and will never be able to leave. We're home.